The Color Palette tool has been updated and now includes dynamic color scheme suggestions based on a selected color. This removes the need to use online color scheme generators, which work excellent but require a lot of copy-and-pasting, especially if you are in the design phase and want to try out lots of different combinations. Colors from these schemes can easily by copied to your target QVW from within TurboView, without any need for copy-and-pasting. This greatly reduces the time required to try out different variations and styles. You can now export color palettes to an external script file that can be included in your load script. 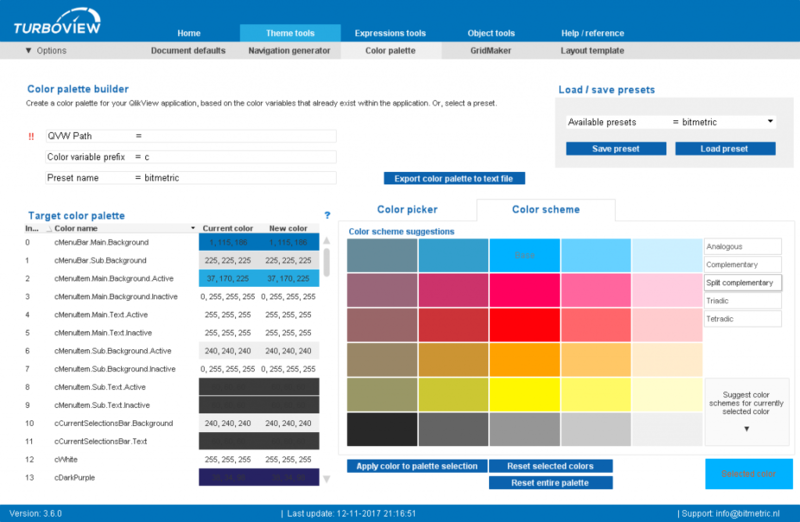 This removes the need to extract the color scheme by extracting the color variables from the target QVW, which further streamlines the design and development process. In previous versions of TurboView, the design grids generated by GridMaker were applied to the entire document. While this works fine, it can be cumbersome when you quickly want to switch between the design grid view and the final view. The first option allows you to apply the background wherever and whenever you want, offering maximum flexibility. The second option lets you apply the design grid to a single sheet, as a sheet background. We find that this last option fits much better into the typical QlikView design workflow, where you tend to work on a sheet by sheet basis. Too many list boxes clutter the layout of your QlikView application, especially if those filters are rarely used. 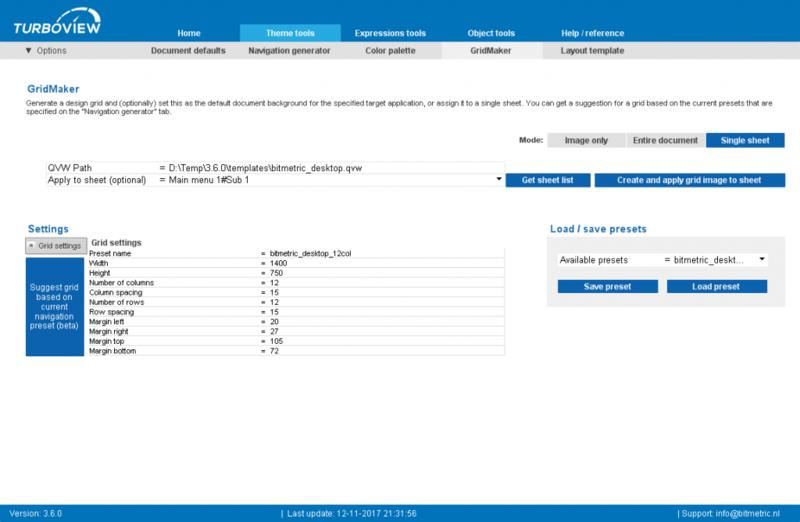 TurboView includes the option to dynamically generate filter panels, This is a lightbox-like popup that greys out the QlikView application and overlays a panel containing filters or other infrequently used objects. In previous versions of TurboView, the objects on the filter panel needed to be placed directly in the sheet where they should appear. They could then be placed on the filter panel manually (by setting the correct layer and hide/show condition) or automatically by reapplying the template. In TurboView 3.6.0, we’ve added the option to create a separate (hidden) sheet to place the filter panel objects. When reapplying the template, the objects on this sheet are automatically picked up and placed on the filter panel on each sheet in your QlikView application. This greatly reduces the number of copy-and-paste actions and further streamlines the development process. Currently, only a single filter panel sheet is supported. Future versions of TurboView will offer the option to define multiple sheets and assign these sheets to different (groups of) tabs. The TurboView Object Library contains pre-styled objects that can be added to your QlikView application and which will immediately adjust to your color scheme. This is especially useful for more complex multi-object visualisations. Multi-object visualizations are now correctly displayed in the object library browser and object mapper. In earlier versions only an image of the first object was shown. 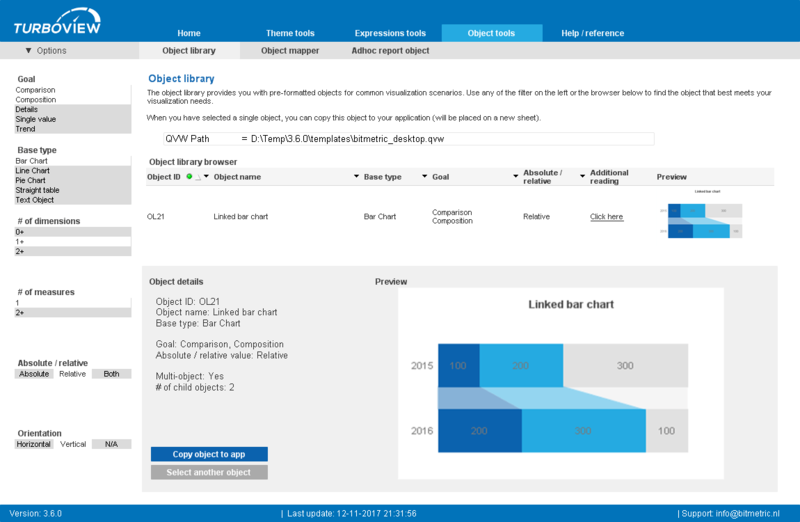 A button to copy the selected object to your target QlikView application was added. This removes the need to lasso or shift-click objects in TurboView to copy them. Object meta data handling has been improved. This makes it much easier to quickly add new objects to the library. Also, when additional information on an object is available, for example a blog post or article on the QlikCommunity, this is now included in the object meta data. This should make it easier and faster to understand how to apply and modify more advanced (multi-)objects. The object library has been expanded with a few multi-object visualizations, for example the KPI tiles shown below (yes, you can change the colors). 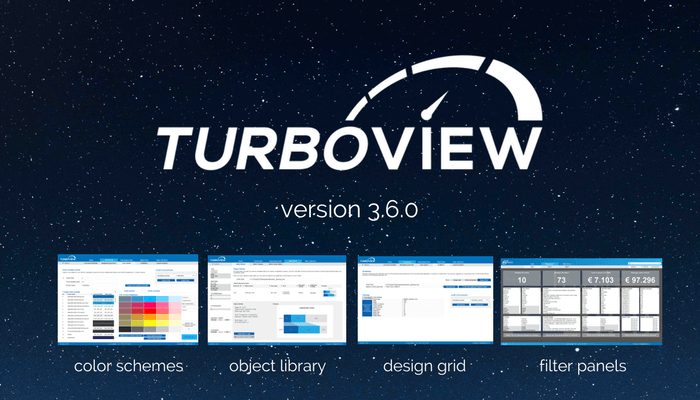 With the improved functionality of the object library, we expect to introduce many new objects in upcoming releases on TurboView. 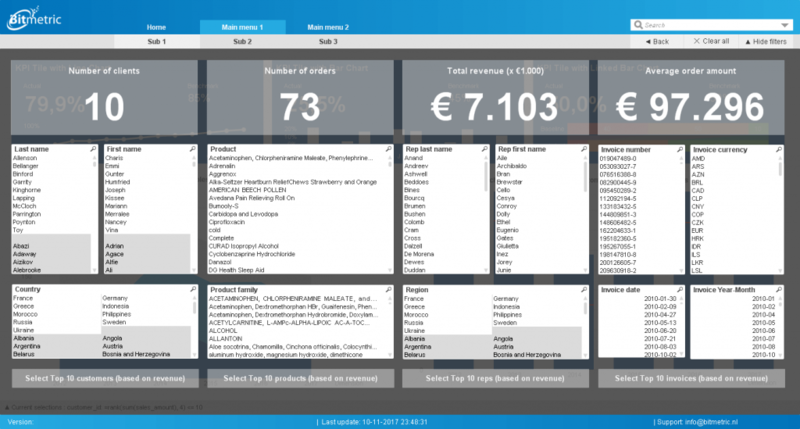 This should make it even easier for you to quickly build visually attractive applications in QlikView, without spending an eternity in all the different dialog windows. Besides the new features and functionalities listed above, we’ve made various smaller improvements in code quality and error handling. Additionally, we have improved the way in which help and hint texts are placed on the menu buttons. You no longer have to reapply the template, but can simply edit them in a variable within your QlikView document.